Answering questions have always been a task for everyone, whether a student, an interviewee or a boss. This is because to every question there needs an answer; that too an apt one. So, you may come across the question of why did you choose a particular stream. 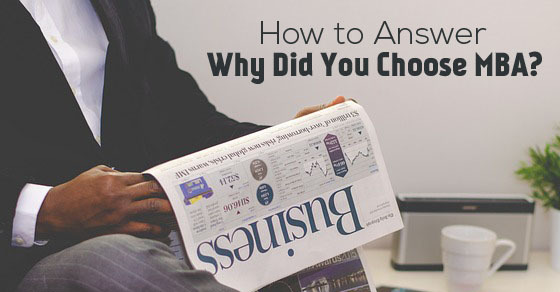 “Why did you choose an MBA degree?” is a common question asked in interviews especially to freshers. You can answer this question easily by providing all the possible advantages like the value of an MBA program, the importance of being an MBA graduate, the opportunities an MBA graduate can receive etc. Also, there are many companies who are looking out for young MBA graduates who can join their workforce and work for their company development and growth. Usually, an MBA degree helps in growing their career to great heights. An individual with MBA degree is mainly given managerial position. Even becoming your own boss etc. Interview Round: Why do you want to do MBA? To be successful in anything, you need to be confident. Self-confidence is the key to all accomplished work. So, even if you have to answer just a simple question, you need to have confidence. Otherwise, the questions about your ability to choose a career may arise during the interview. Do not speak anything. Means, whatever you say should be in context with the stream you chose. Speaking anything will not do any good. Rather, it will reflect that you were never focussed and took a particular course just for a time pass. You can tell the reasons why you choose like MBA does not just make you learn the management skills, but also is an advantage for a good and handsome salary. Or you may even explain that MBA is something you were always interested in as it gives lots of scope for exploring varied fields while working in an organization. Many more viable reasons you can mention, so as to make the listener clear about why you choose MBA to build up your career. You can explain that after you are done with your bachelor’s degree. You have to do a master’s one to complete the education. So, the MBA is always a good option as it can never go out of demand and fashion. Also, it includes under professional course and is resourceful when compared to any other postgraduate degree. Every MBA student is expected to be smart and witty. This is the image created in the minds of the professionals. So, when you answer the question why you choose MBA, just reply with a smart and witty manner. The fumbling tone of the answer will create doubts in the minds of the interviewer. This MBA degree is also valid abroad. If you wish to go abroad after your MBA, you can go and that too without having to gain one more degree from that particular place. Usually, students have to do one degree from abroad to settle there, but once you have done MBA, you will not find any difficulty. For MBA, you need not necessarily be from the commerce background only. You can do post graduation in MBA even after you have done fashion designing or say journalism. So, this is also one of the advantages to opt for an MBA degree than any other course. MBA is not just restricted to finance only, rather there are a number of other options like in human resource, marketing, management, communication, accounts, economics, and so on. You can opt for any as per your choice and interest level. This kind of option is not available as such in any other stream. So, this is one of the reasons you can say while answering the question of why. MBA is one stream in which the pass outs gets good salaries compared to those who are in other streams. Not just the salary has been the point, but also the status that it provides. In our society, if you say you are doing arts, your decision is not respected but if you say you are an MBA, you are highly appreciated and admired in the society, family and even friends. Career opportunities are termed better when you get to do what you love the most. Like everyone wants to work by being in a higher position. So, this is exactly what an MBA student gets. An MBA student gets a chance to be at the managerial position or being a part of the board of directors and so on. Although one can be a part of higher managerial positions by pursuing other streams also but not as early as with an MBA degree. One also gets detailed knowledge of business management. The detailed information is not received in any other business course. One gets all the knack of handling the business within two years of the study. So, this is also one reason you can give of why you chose MBA as a good option. When you are a fresh MBA pass out, you are actually not fresher as you already have built lots of contacts. So, this career gives you lots of opportunity to enhance the business network already before jumping into the field. So, this is a great opportunity to widen the ideal networking and familiarize with maximum people at a time. As this course gives a number of challenges in the form of assignments to the students. The students attain a smart and professional look. The course with its work enhances the personality of an individual which other courses might fail to do so. So, you can also give this reason while explaining why you choose this course in particular. MBA is very flexible in the manner that one can pursue, it as a full-time course as well as a part-time too. Part-time means a student can work side by side and become a post graduate hence fulfils dual purposes. Although other courses also provide the same, yet the level of credibility and flexibility is higher when talking about MBA. Though an MBA is masters in business management, it also helps a student in enhancing communication skills. The students are taught how to speak clearly, fluently and distinctively with confidence. They teach the art of language, how to add meaning to the words through various presentations in the lectures in front of the whole class. This way the confidence of the student is also built which is invaluable in the business world. When a person becomes a professional, the vision and the perspective of an individual changes. In actual the vision becomes wider and more positive. This is not only good for an individual self but also is essential on the professional front. The mind gets trained as per the needs of the company and you are able to satisfy the goals, vision of the company. One needs to do less struggle as the person is directly enrolled for higher positions in offices while in other streams, one has to first work at lower levels and after few years of working, the higher positions are designated to an individual. So this way, one has to do less struggle and more success is attained by an individual. This course also ensures higher credibility in terms of the learning process as well as stability and settlement in one’s life. You become an expert in one thing and makes an individual focussed about what he or she wishes to do. It helps in taking a firm and final decision in life of an individual. You do not get astray from the path when it comes to choosing a career for oneself. This is one of the good reasons you can give to an individual. As many other courses do not allow you to do your own business but his course helps in establishing your own business. At any point of life, if you feel like quitting a job, you can open your own business. So, this can also be one of the main reasons. Choosing a career is a very important step in our life and it should be taken very carefully. Your education also plays a major role in it. Though there are many advantages of taking up MBA, the best part about it is that it helps you craft a successful life for yourself. What does an MBA give you? So, above are some of the reasons you can say to someone who asks why you happened to choose an MBA as your career option. Whatever you choose in life, make sure the choice is right. This is because if you will choose something not of your interest, it will land you nowhere in life and will leave you wondering where to go and what to do. So, it is better to choose something which gives you a foundation to reply and face the questions.